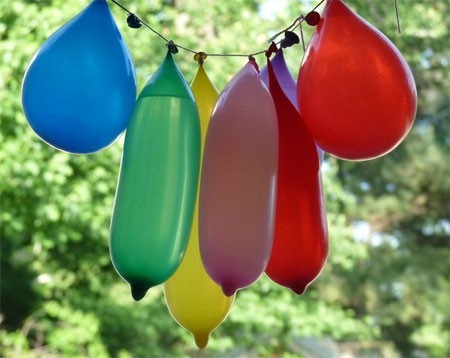 I found this fun water balloon piñata idea at www.Ziggityzoom.com and thought it looked like the perfect solution to cooling off during our hot summer days! Okay, now I ask you…what better way to have fun this summer than with water balloon pinatas!? I mean seriously! I’m not sure about you, but my kiddos absolutely love pinatas. And the thought of spraying nice cool water all over them in the heat we’ve been having makes the pinata idea even sweeter! Another thing I love about this idea…it’s super easy and cheap! Fill balloons full with water using a funnel or water balloon hose attachment and tie securely. Using string, hang balloons from a tree or patio overhang. Tie balloons high enough for kids to reach with a bat, but not too low, you want the water to rain down on them! Take turns swinging at the balloons making sure other participants are far enough back they don’t get hit by the bat. Grab your camera so you can capture all of the fun as the balloons burst open spraying water all over your eager participants! Hope you have fun staying cool this summer! Totally fun! I’m always inspired what you come up with. Today I award you the Very Lovely and Inspiring Blog Award. Congrats!